Want to tackle your own container? It can feel overwhelming, but we’re here to help! 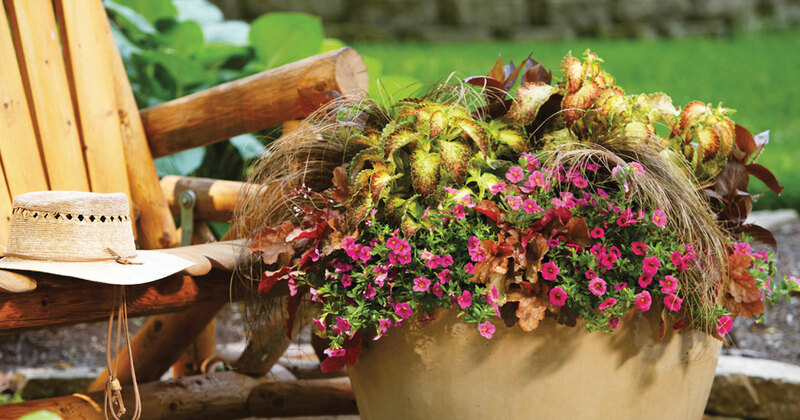 Learn Prairie Gardens & Jeffrey Alans top tips for nailing your first container design. Where you container will be placed is the key to the types of plants you should place inside it: sunny or shady varieties. Containers placed in an area that receives less than 5 hours sun should be filled with shady varieties. Containers placed in an area that receives 6 or more hours of sun should be filled with sunny varieties. Knowing whether you should be looking for sunny or shady varieties helps narrow down all the overwhelming options! It’s not only important to pair plants together that have similar light requirements, but also watering requirements. For example, succulents & petunias both love sun, but succulents prefer to dry out in between waterings, while petunias prefer to be watered more often and stay evenly moist. If both are placed in the same pot & watered the same way, one will suffer while the other flourishes. What kind of container do you need? The options are endless! It’s up to you when it comes to your container, but it is best to choose a container that has drainage holes to allow excess water to drain. You do not want excess what to sit in the base of your container…this can lead to root rot. If your container does not have a drainage hole and you cannot add one, you can fill the base of your container with rock – excess water can hang out with the rock and still allow the soil to dry out. Or you can keep your container in another pot that you set inside your container. Remove it when you water, let the excess water drain and put it back in your chosen container. How many plants you will need can vary, but as a general rule, you’ll need about one plant per every 3 inches of your containers diameter. So if you have a 12” container, you should plan to plant about 4 plants. But this can vary depending on the size of the potted plants you are choosing. It’s best to have your empty container with you as you pick and layout your plants to help gauge if your container will be full enough. When should you start your container? As soon as possible! You’ll want to give your container enough time to grow and fill out, so it’s best to start your container right after our frost-free day, which is typically around Mother’s Day for our area. 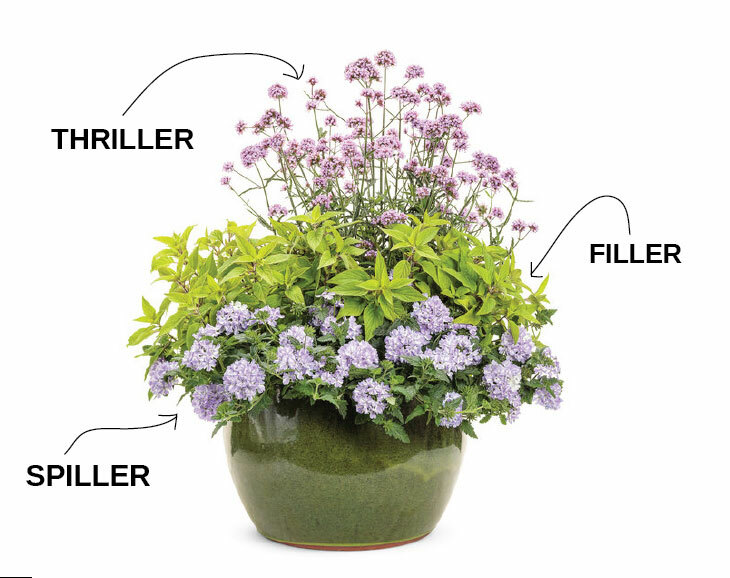 An easy rule to go by when designing your containers is mixing Thrillers, Fillers & Spillers. Thrillers are plants that have upward growing habits – they’ll likely be your focal, since this will be the tallest plant in your pot. Fillers are plants that have more horizontal growth habits – they’ll help fill out the middle height level of your container. Spillers are plants that have a cascading growth habit – they’ll cascade over the sides of your containers and spill downwards. Mixing these 3 types of plants is a great way to have a well rounded, beautiful container design. Accent plants are plants that are primarily foliage and have few blooms. Mixing these in often times benefits the container by breaking up all the blooms and adding texture. Greenery is a good thing! Choosing plants that are different in shape, texture, & bloom size will add interest to your container. There’s no rule saying you only have to only use your common annuals – feel free to mix in perennials, shrubs, tropicals, houseplants & more. Even some edible vegetable plants are very fun to use! Feeling overwhelmed or looking for a quick fix? There are so many pre-made containers and hanging baskets out there, we always love using them to our advantage. Love a hanging basket? Pop it in your pot & remove the handles. Or love a already made up container? Pop it in your pot! You can even pick out a few extra plants to add to the hanging basket or container. This is a great way to make a container fast, and often times, leads to a fuller container sooner. The soil you use is very important for the health of your container! A good potting mix should have the right balance of air, moisture and nutrition. Without a high-quality potting mix, your plants roots may fail to establish. We recommend Miracle-grow Potting Soil – find it with Prairie Gardens bagged goods. Remove your plants from their nursery pots and prior to planting them in your container. Before you pot them into your container you’ll want to loosen the roots some. Just lightly tug and run your fingers through the bottom roots. This will help the roots to establish in the new soil instead of continuing the wrap around the soil of your plant. You want the roots to grow outwards and down instead. Dig a hole and hole where you’d like your plant to go and then lightly pat soil around it to help remove air pockets. Give it a water when done! Soil in containers can often lose nutrients after watering. Over time, nutrients will drain out along with the water. Replace these nutrients by fertilizing during the growing season by using a slow-release fertilizer or a liquid fertilizer. You can find both on our Solutions wall with Plant Experts always near by to help. If you container is starting to look leggy, just give it a trim! This will promote new growth and allow your container plants to focus their energy elsewhere. Containers lose water faster than plants in the ground, so make sure you are watering consistently and often. It’s best to water in the morning – to ensure your container has the water it needs through out the heat of the day. During spring and summer, you’ll likely need to water once a day, but it all depends on weather and how exposed your container is. On warm, windy days you may need to water more than once. On cold, rainy days – you may not need to water at all. It just depends! A good way to check if you container needs to be watered is by using the finger test. Stick your finger about an inch into the soil, if it is wet…you do not need to water. If it is dry…it’s time to water. However, keep the weather for the day in mind, if it’s going to be a hot one, you’ll want to go ahead and give it you container a water even if the soil is somewhat moist. ← Is it Time to Plant Yet? What you can and should not plant in April!